Artis Wodehouse’s unique career is based in her formative studies as a pianist. Her first teacher, Ludmilla Berkwic trained both in Russia (where she was a classmate of Vladimir Horowitz) and Poland. For two years she studied with the Ives and new music specialist, George Pappastavrou whose wide-ranging musical interests and unorthodox approach set a model for action. In 1969 she received a Master of Music from the Manhattan School where she studied with the Debussyist Ernest Ulmer. She entered Yale in 1969, during which time the social/political climate set in motion a period of unprecedented educational experimentation at the Yale School of Music, a unique situation of which Wodehouse took full advantage. She received a Master of Music from Yale in 1971. Wodehouse then moved to California and entered the Stanford doctoral program to pursue her interest in historic performance practice. Her pioneering doctoral work at Stanford using historic sound recordings of pianists born before 1900 set the course for over a decade of performance-oriented research which culminated in her transcriptions of George Gershwin’s unnotated phonograph disc recordings from 1926 and 1928 which were published by Warner Bros. in 1987. This publication plus a grant from the National Endowment for the Humanities (1989-90) opened the door to nearly 15 years of unbroken work on both Gershwin and his piano performer/composer contemporaries. Included during this time was the creation (using the Yamaha Disklavier) of three CDs on the Nonesuch label of piano roll recordings (including the best-selling Gershwin Plays Gershwin), the 2003 release of Confrey Piano Rolls and Scores on Warner Classics, and the historic 7-CD set on the Pearl label called Keyboard Wizards of the Gershwin Era. She also produced two additional books of piano transcriptions: Gershwin’s Piano Rolls (pub. Warner Bros.) and Jelly Roll Morton’s Piano Rolls (pub. Hal Leonard). In 2000 Wodehouse discovered a little 4-octave Mason & Hamlin foot-pump reed organ in a dumpster. Her rescue and subsequent restoration of this instrument lead her to initiate her current project, learning to play and to perform the plentiful but little-heard music written for the reed organ and the harmonium. This undertaking required the acquisition and painstaking restoration of a number of different types of instruments. From 2000, Wodehouse has amassed and had restored a collection of several representative and useful organs. Three were built by the American firm Mason & Hamlin: the Model 86K from 1916 with 16 stops (tuned A442) referred to by Arthur Bird as an “American Harmonium”, and a Mason & Hamlin Liszt Organ of 1887. Wodehouse’s Liszt Reed Organ represents one of the finest examples of 19th century reed organ building in America. Franz Liszt’s name came to be used for this model possibly because he taught the American pianist William Mason, who was related to the family that founded the Mason & Hamlin firm. The instrument is foot-pumped and operates on the suction principle, the air being drawn inward causing sets of brass reeds to sound as the keys are depressed.Wodehouse’s 2016 CD recording, Arthur Bird Music for the American Harmonium on the Raven label summarizes her work to date in the field of the American reed organ. Other instruments in Wodehouse’s collection include an 1860 Steinway square piano, a bentside spinet harpsichord, two portable American “Preacher’s” organs by Bilhorn and White, an 1864 Treat & Davis Melodeon, two Yamaha reed organs from the 1950s-60s, and six vintage Schoenhut toy pianos from the 1950s-60s. In 2006 Wodehouse acquired a French-designed German-built double manual normal harmonium built in 1885 by Philippe Trayser. The harmonium sounds through brass reeds and is foot-pumped, but unlike the reed organ operates on the pressure principle like a trumpet. Distribution of the harmonium remained confined mainly to Europe, and there are very few working harmoniums in the United States. In July 2008 Wodehouse was asked by conductor Louis Langree to join the Mostly Mozart Orchestra at Avery Fisher Hall, Lincoln Center to play her Trayser harmonium in Schoenberg’s chamber music version of Mahler’s Das Lied Von Der Erde. This performance was broadcast nationwide and was the first time a harmonium was used with this ensemble. 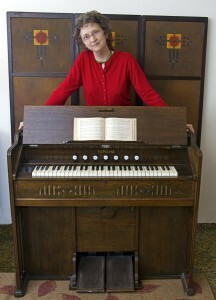 Wodehouse acquired her 1903 Mustel Art Harmonium in 2010. Mustel is considered the preeminent designer and builder of the harmonium, and the tone of the best instruments built by this firm has set the standard for all others. The Art Harmonium, as opposed to the normal harmonium is a special model with expanded performance capabilities. In 2010 Wodehouse founded the chamber group MELODEON to present little known but valuable music from 19th and early 20th Century America, using her antique instrument collection as the basis for repertoire choice. Pianist and harmoniumist Artis Wodehouse has devoted her careeer to preserving and disseminating neglected but valuable music and instruments from the past, with an emphasis on American music. Cited by the NYTimes as “savior of the old and neglected”, she received a National Endowment grant that propelled her into production of CDs and published transcriptions of recorded performances and piano rolls made by George Gershwin, Jelly Roll Morton and Zez Confrey. Her best-seller, “Gershwin Plays Gershwin”, on the Nonesuch label has sold over 500,000 copies. Beginning in 2000, Wodehouse began performing on a representative group of antique reed organs and harmoniums a benside spinet harpsichord and an 1860 Steinway square piano that she had painstakingly restored and brought to concert condition. She founded the chamber group MELODEON in 2010 to present little known but valuable music from 19th and early 20th Century America, using her antique instrument collection as the basis for repertoire choice. Wodehouse has a BM from the Manhattan School of Music, an MM from Yale, and a DMA from Stanford.